This Murphy P62 is probably the rarest radio in my collection along with another New Zealand assembled radio, the Sony TR-610 'Pacemaker'. It was ‘manufactured’ in New Zealand under license by Allied Industries Ltd circa 1959. It is a re-branded Toshiba 6TP-309 ‘Deep V’ and in reality it was most likely ‘assembled’ from imported parts rather than ‘manufactured’ here. 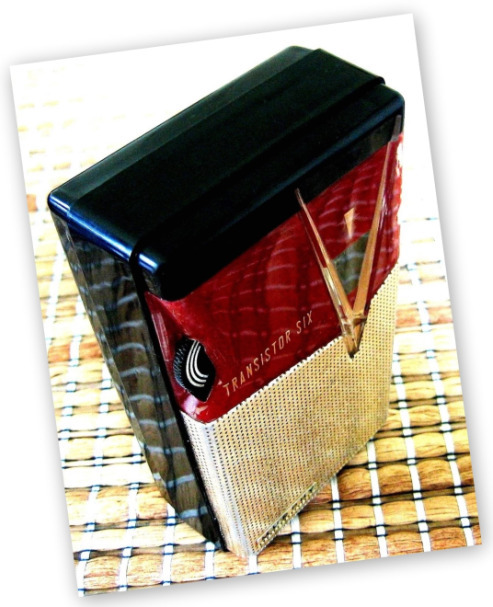 As discussed on the homepage of this section radios were a prohibited import into New Zealand from 1938 until 1975. Import restrictions such as these were aimed at protecting and enhancing local industry. Shrewd local manufacturers either turned their talents to designing radios from scratch or in this case importing all the parts and assembling them here as a re-branded model. This Murphy P62 ‘Deep V’ is a very rare model indeed. Although I live here in New Zealand I had never seen one until I picked this example up at a local auction house. To find a re-branded Toshiba 6TP-309 is one thing but to find it in this color is something else. The Toshiba ‘Deep V’ was originally released in only three colors; white, yellow or black. This ‘reddish maroon’ and black color scheme is simply fantastic! Update: On the 5th of July 2010 I received the following from Nick Bruyer regarding the P62 cabinet colors. 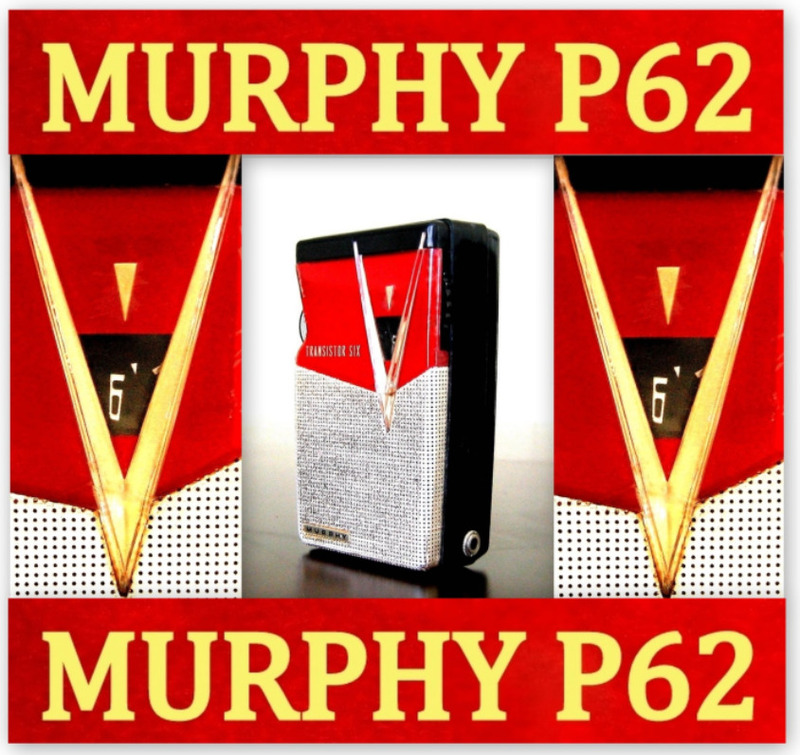 Hi James, I thought you might like to know a little more about the Murphy P62. It came in three colors: Black with a maroon painted dial cover (like yours), Maroon with a black painted dial cover; and yellow with a black painted dial cover. The yellow is different from the regular Toshiba model, which actually is chartreuse, not yellow. 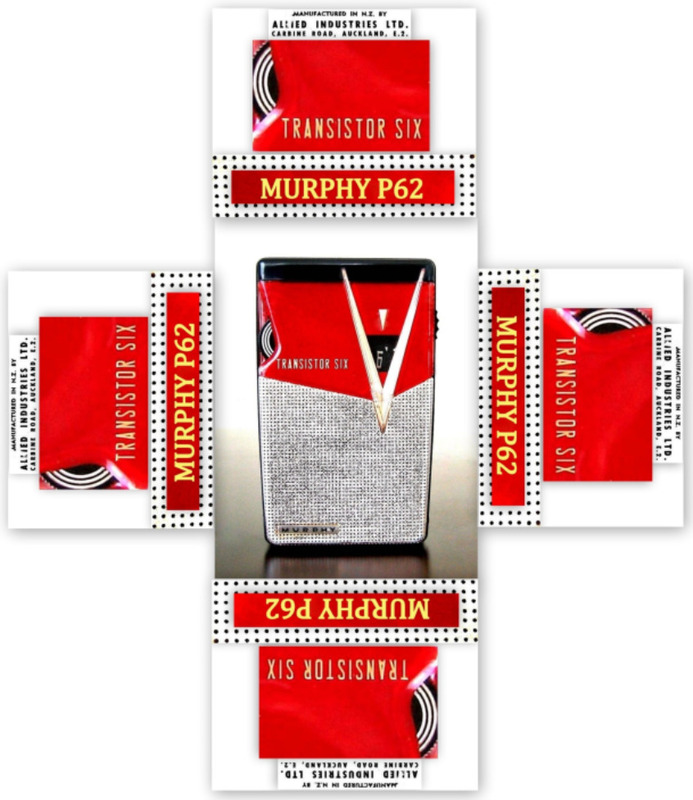 The three color combos for the Murphy radios are unique and not found in the regular Toshiba production. 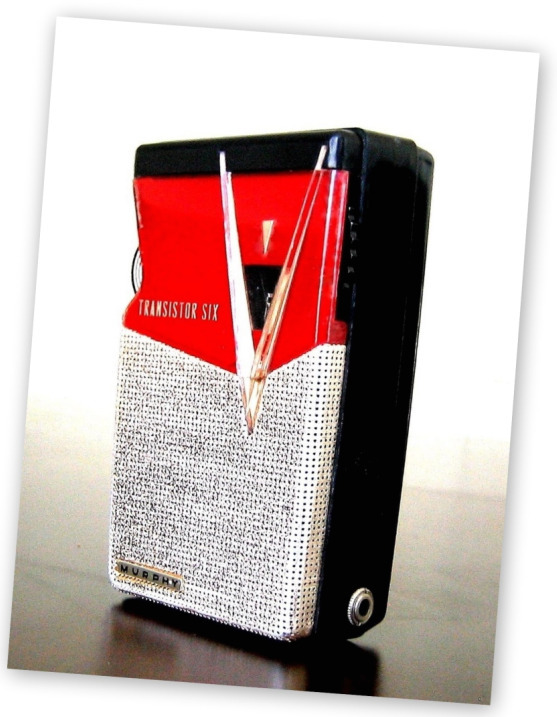 Toshiba designed many of the greatest transistor radios of the late 1950’s and early 1960’s. Their designs are legendary amongst collectors and they are highly sought after. Toshiba Corporation is one of Japan's oldest and largest producers of consumer and industrial electric and electronic products. Toshiba Corporation's roots can be traced back to the Tokyo Electric Works Company formed in 1875. 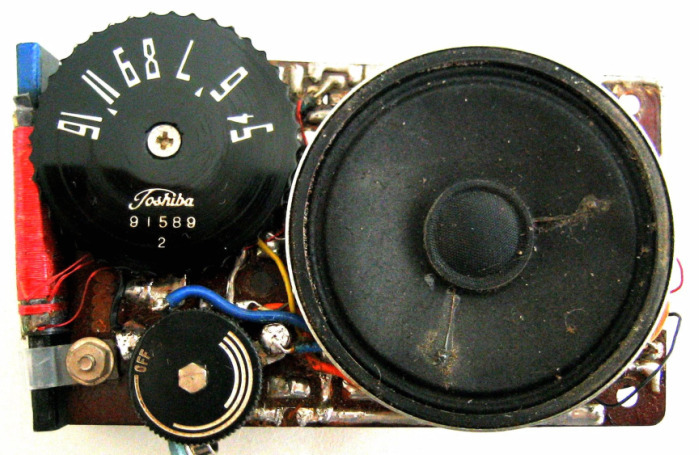 For more on Toshiba check out my Japanese radios section. 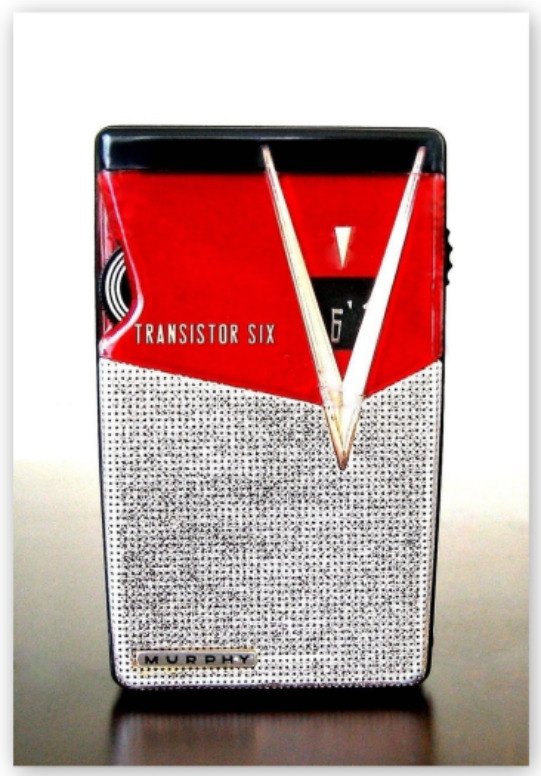 This ‘Deep V’ was assembled under license from the Murphy Radio Ltd of Welwyn Garden City, England. Murphy possibly acted as a third party between Allied and Toshiba. Murphy Radio Ltd was established in England in 1930. 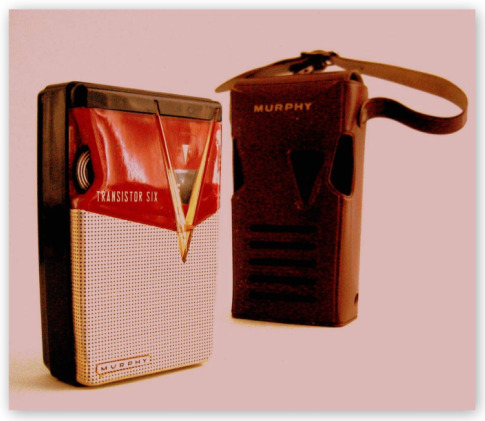 After the War, Murphy licensed the manufacture of their radios in New Zealand to Westco Products Ltd. This relationship finished in 1956 and Westco went out of business shortly after. 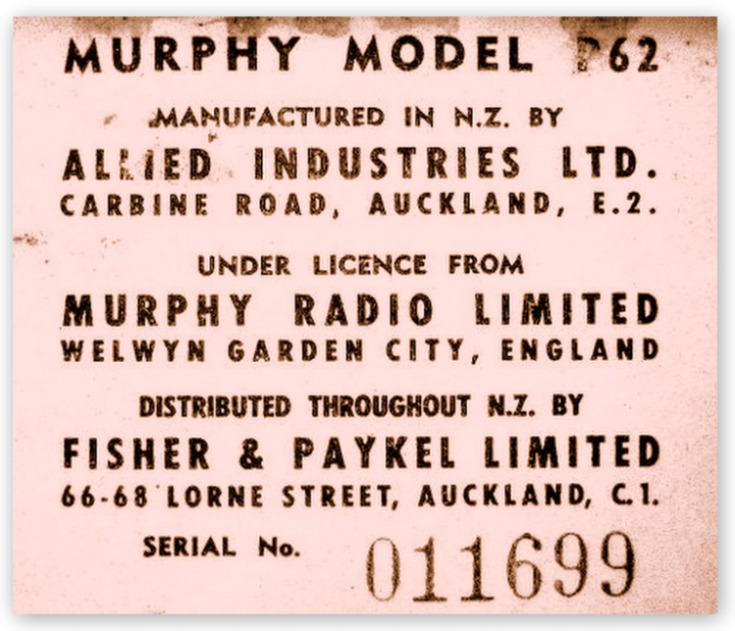 The license to manufacture radios under the Murphy name passed to Allied Industries Ltd. Allied is a subsidiary company of Fisher & Paykell who distributed the radios. 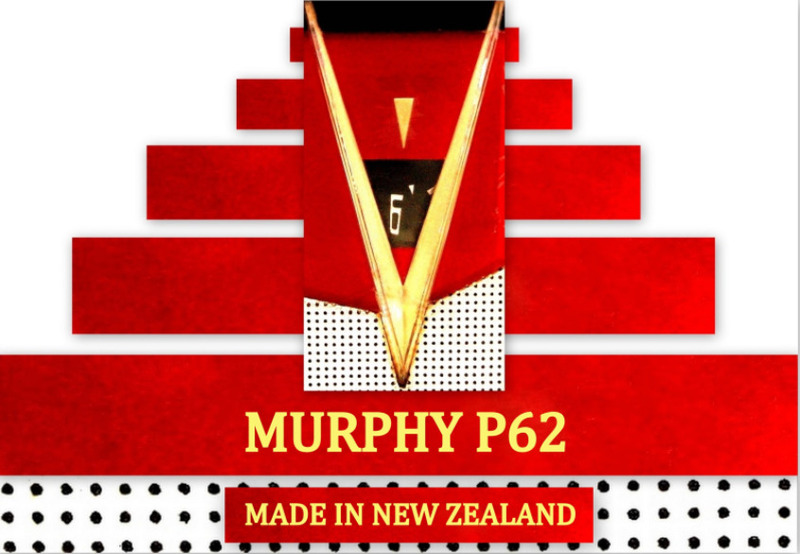 'Allied' Murphys were made specifically for the NZ market and bore only passing resemblance to UK models. Ref: Dave's Rust 'n' Dust Homepage. This Murphy is all Toshiba inside of course.